Are you still using the plain old telephone system (POTS) to run your business? 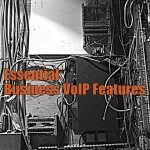 How do you know when it is time to switch to VoIP? I am going to briefly discuss what are the 3 main reasons its time to ditch your POTS solution for VoIP today. When was the last time your incumbent POTS provider released a new feature? Maybe the last feature your provider released was caller-ID, or perhaps it was voicemail. Whatever the feature was, it was long ago. The POTS infrastructure is old and out of date. Unfortunately, for the providers, it is very expensive to keep it in service and let alone upgrade to offer new features to businesses. So what do you do? The good news, you are not out in the cold! If you are adamant on staying with analog phone lines, you can simply purchase a hybrid-PBX phone system that can connect to your POTS provider and offer you the world of VoIP internally to your IT infrastructure. The bad news is, when was the last time you hosted your own equipment (think email server, web server, etc)? What will you do when it goes out of service? The majority of advancement in IT and telecom is related to the internet, mobile, and cloud-based solutions. Having a mobile cloud-based business voip system provides you with a flexible and reliable service that you don’t have to worry about. Along with the advancement in business through the internet, the workforce naturally shifted the way they work, when they want to work, and where they work. Having the flexibility to work from home, coffee shop, or while travelling is integral for employees and stakeholders. Bring your own device (BYOD) is becoming more important with companies with all the various personal mobile devices that people own. Many of which would rather be able to connect to work resources from personal devices. Can you connect any device to your current phone system? Along with recurring bills from your telephone provider, there are costs incurred every time a change is needed. Whether it is to update a person’s name, add a new employee, or update the company greeting, you will need to call a certified technician to make the updates that typically takes them 5 minutes. With cloud-based business voip solutions, not only can you make the changes and updates yourself, you will never have to call a certified technician again. As everything migrates to the cloud, it is definitely time to switch off the plain OLD (keyword: old) telephone system today.